When choosing logs for your pizza oven, the priority should be the moisture content and wood species followed by the size of your logs – thinly cut logs are essential. Pizza ovens require logs that are low in moisture content to eliminate smoke generated by the fire – no-one wants pizza that tastes like it’s been sat on a bed of ash! This makes kiln dried logs the best option when buying logs for cooking, providing the moisture content is less than 20%. Thinly cut logs like our specialized pizza oven logs will ensure you can create small, easy to light fires that reach your ovens desired temperature quickly, giving your pizzas that crisp and tasty wood-fired base. Warning: Using logs that are too thick or high in moisture will lead to incomplete combustion and you will struggle to achieve or sustain the cooking temperatures required. Unlike compressed waste sawdust products such as briquettes that may contain chemicals and binders, real logs don’t generate excess dust or ash that can land on and ruin the taste of your pizza. The species of wood determines how long the logs burn for – only use hardwoods such as birch, ash and oak to avoid fluctuations in cooking temperature. Use some of our natural firelighters to establish your fire with a handful of kindling before adding your logs to create a long sustained fire that will cook your guests’ pizzas within minutes. The art of cooking delicious wood-fired pizza with professional results and becoming a master “Pizzaiolo” is effortless when using the correct type of wood and size of logs. Our thinly cut mixed hardwood logs are perfect for using with pizza ovens – we deliver our nets of wood for pizza ovens nationwide to residential customers and supply wood fired pizza restaurants all year round. Specialized thinly cut pizza oven logs in nets specifically designed for use in outdoor pizza ovens and restaurants.. Please contact us if you have any other questions about our logs or using them to cook with. Much is said about the heat value, cost benefits and protection kiln dried logs offer, however very little is said about how they come to be and the process behind kiln drying logs. We believe in educating our customers on all aspects of kiln dried firewood so they’re intimately familiar with what it is they’re buying from us. A kiln is a large structure, similar in nature to an oven, except there are vents to control not only the heat but the humidity of the circulating air inside the chamber. The kiln is fuelled by fire, normally the byproducts from cutting of the trees and splitting of the logs. The process of kiln drying changes dependent on the species of wood being dried, the size and diameter of the logs and what the intended end moisture content is – kiln drying is a constantly evolving science, and as such our sole supplier conducts studies with their local university in refining their methods; this is one of the reasons we only use one supplier for our firewood. Our supplier only fells trees from sustainably managed forests – trees are inspect and selected for quality and suitability, and then chopped down. After this, they are taken back to the premises to be cut in exact lengths of 25cm or 10″ inches, the perfect size for wood burning stoves, and then each round log is processed through a machine that splits them in to the logs you see on our website – at this point they are ready to enter the kiln for drying, as they still contain up to 60% water. The logs are thrown loose in to metal cages to ensure there’s plenty of gaps of air between each logs and are placed inside the kiln. As the kiln reaches the ideal temperature and relative humidity, moisture within the logs begins to be drawn out of the wood in to the surrounding chamber of the kiln, and the circulating air removes the moisture from the air – this process repeats until practically all of the water from within the very inside of the log is removed, leaving an extremely dry and ready to burn log that’s below 15% moisture, far drier and superior to any seasoned wood the UK climate could air-dry naturally over a few years. The whole kiln dry process takes just 3-7 days depending on the outside climate conditions and volume of logs being dried. As kiln drying can be accomplished in as little as one week, this means we can now purchase firewood that’s ready to burn all-year round, and waiting for traditional suppliers of firewood to season and managed their stocks efficiently is a thing of the past – no longer are consumers forced to purchased semi-seasoned or wet logs during winter when supplies have run out. 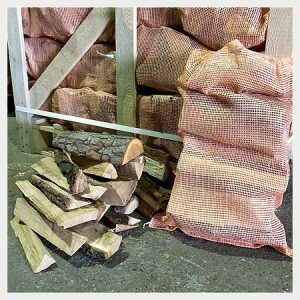 Kiln dried firewood has transformed the firewood industry in recent years and with the ability to warm our homes faster, with easier to light and longer burning fires, consumers, chimney sweeps, stoves and flues are all far better off for it. Click here to view all of our kiln dried firewood.